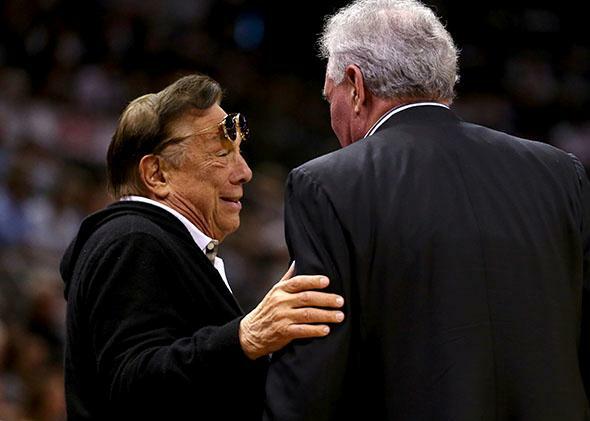 Donald Sterling racism: Why the Los Angeles Clippers need to boycott their next playoff game. Why the Los Angeles Clippers need to boycott their next playoff game. Team owner Donald Sterling of Los Angeles Clippers (left) talks with team owner Peter Holt of the San Antonio Spurs during the 2013 NBA Playoffs in San Antonio, Texas. The pressure is mounting on Los Angeles Clippers owner/professional racist Donald Sterling. The National Basketball Players Association wants Sterling banned from the rest of this year’s playoffs and has asked Commissioner Adam Silver to hand down the “maximum” possible punishment. Prominent folks in the league, including LeBron James, Magic Johnson (who will himself boycott all Clippers games from now on), and even the normally politically reticent Michael Jordan have said in various ways that Sterling doesn’t belong in the NBA. And on Sunday, the Clippers played and lost their playoff game against the Golden State Warriors after wearing their warm-up jerseys inside out in silent protest. Of all the actions that have been taken since Sterling was caught on tape saying (among other things) that his girlfriend shouldn’t be seen with black people, this is the one that left me the coldest. Yes, it’s refreshing that the team has let the world know that Sterling has crossed a line, but the protest itself was disappointing and lame. #BoycottClippers shouldn’t just be a trend on Twitter. The players should not suit up for Tuesday’s home game against the Warriors. After all, the simple act of refusing to display your team’s name means little when you’re still making money for someone who holds both a position of power and racist, antiquated views. SB Nation’s Tom Ziller argues that it should not be “up to the victims of behavior to fix the problem,” and the New York Times’ Harvey Araton says it would be “stretching reason” to expect the players to have staged a boycott over the weekend. From a purely pragmatic standpoint, perhaps this is true—the worst that can happen to Sterling, after all, is that he sells the team for hundreds of millions of dollars and gets even richer. But such arguments don’t consider the social and cultural impact of a teamwide boycott. It also doesn’t matter whose “responsibility” it is to take on Sterling. National Basketball Players Association President Chris Paul, Blake Griffin, and their teammates had the chance to make a statement that the league and its fans would not be able to ignore. Instead, they turned their practice jerseys inside out. The Clippers aren’t unusual, in sports or in the rest of society, in choosing not to take a stronger stand against the man who signs their paychecks. But when compared to Muhammad Ali, Jim Brown, and other prominent black athletes whose names have been invoked in the wake of this controversy, the Clippers don’t have nearly as much to lose. Their individual wealth is vast, and it’s hard to believe that other teams (and even more advertisers, and fans) wouldn’t support them. Though the risk to the players wouldn’t be as great, the payoff of a boycott would be just as powerful as any protest of yore. As Josh Levin points out, while the players may be making millions, they’re also essentially owned by the billionaires who invest in their team. When you throw in the fact that the vast majority of owners are white and the players are overwhelmingly black, we get an ugly power imbalance that has been rightly compared to that of plantation-slave dynamics. Refusing to step out on the court would have been an assertion of the power the players don’t seem to realize they possess. It would also have been a call to re-evaluate an industry that has continuously propped up a bigot like Sterling. The Clippers clearly do not feel good about working for Sterling, and the team’s sponsors are beginning to flee. The singer Tank, who was scheduled to sing the national anthem before Tuesday’s game, also says that he has chosen not to perform. Chris Paul and his teammates should follow Tank’s lead. According to Yahoo Sports, “The Clippers players are contemplating making a bigger statement during Game 5 of the series against the Warriors on Tuesday in Los Angeles.” Let’s hope that bigger statement is the biggest one they could possibly make. If they don’t take the floor, there can be no mistaking what the Clippers think about their owner, and the NBA will be forced to take notice.